Since I am a nature girl, I love the writings and contributions of John Muir. His words and deeds helped inspire President Theodore Roosevelt’s innovative conservation programs, including establishing the first National Monuments by Presidential Proclamation, and Yosemite National Park by congressional action. In 1892, John Muir and other supporters formed the Sierra Club “to make the mountains glad.” John Muir was the Club’s first president, an office he held until his death in 1914. Muir’s Sierra Club has gone on to help establish a series of new National Parks and a National Wilderness Preservation System. From The John Muir Exhibit. How fortunate for all of us that men and women had the vision and foresight to influence and establish National Parks that people worldwide now cherish. Our satisfying leisure experiences depend on the vision of those who came before to create and leave a legacy of the values of nature and conservation. I had the image of the leaves and wanted to use it for something. I got the idea to place a quote about autumn over the image and I found this gem. 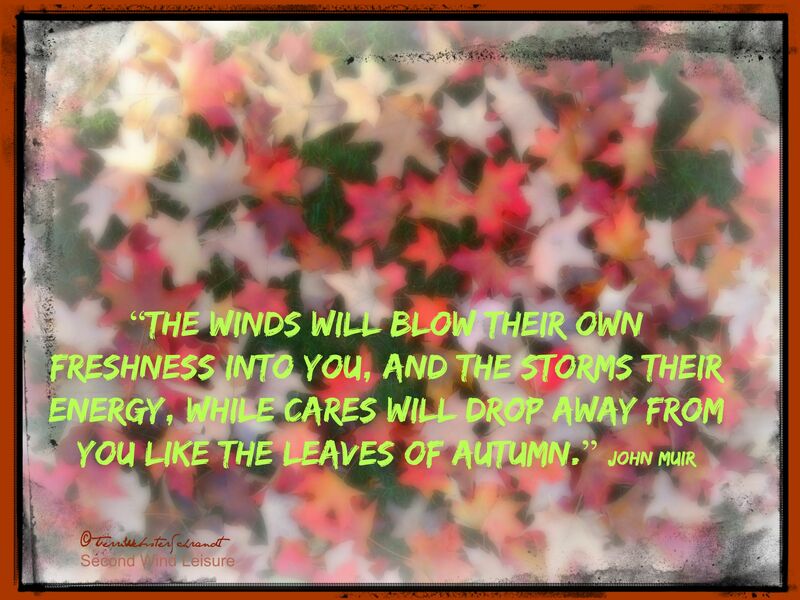 Not only does the quote convey the season of autumn, it even incorporates the element of wind (air). I created this image for my Facebook page that promotes my consulting business. Please enjoy this contemplative leisure moment! What a beautiful quote Terri. I love being outdoors and this quote describes autuumn perfectly. I love autumn in the US. I have visited the US three times and always around ‘fall’ – such gorgeous colours. Thanks for sharing with us at #WednesdaysWisdom. Perfect for the season. Beautiful image and wonderful quote. Love that new header with the John Muir quote. Well done! I love quotes that are so life affirming and it’s amazing to see a “greenie” looking after the world so long ago! Our national parks are a true treasure. Unfortunately, many today – those without the vision of Muir and others – are threatening their existence. Some feel that if they can’t turn a profit they need to be turned over to business interests so their natural resources can be exploited. We need to remain vigilant so this doesn’t happen. Good post! Thanks Janis, I remember your awesome post from July on this subject! Cares dropping away is a great thing! I just got “The Wild Muir- Twenty-two of John Muir’s Greatest Adventures.” Great post! Thank you So much for following me on my blogging journey<3 The support means very much to me! Thank you, Julia! Glad to hear! I really like that quote from John Muir. It captures how nature does make you feel in places like Yosemite National Park. I have also enjoyed the old growth redwoods of Muir Woods, on the coast in Marin County just north of San Francisco. Thank you, Doug, isn’t that great? The Muir Woods are absolutely beautiful! Walking dogs is great, esp along the beach! I have an obsessed ball chaser too! MY Border Collie, Bilbo, is so obsessed that he’s trained the other dog walkers to throw the ball for him and he chases other dogs’ balls as well. They’re all very friendly at our beach so that’s not a problem.